Oswestry Borderland Heritage - Copper Mine Rednal. 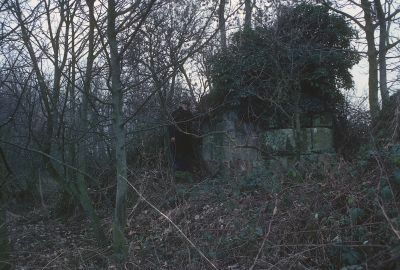 Rednal Copper Mine(Also known as Eardiston) produced some rich ore. In the 1840's, samples of ore were found to contain 18.5% copper, much better than usual for the county where a figure of less than 10% was normal. The landowners hoped that the royalties from this mine were going to financially endow a church by raising £200 p.a. for five years, but while it may have helped, it did not fully achieve the aim. In the event the income from the royalties were replaced by the sale of fishing rights on a lake at Pradoe, the country house of the Kenyon family who owned the area mined and built the church. The first recorded mining was the sinking of 3 shafts in 1827 by David W Jones, the'Lime Man' of Oswestry, who was granted an 18 month search note in August 1827 with a 21 - year lease to follow, if wanted. He dug down about 10 metres and encountered water problems which he could not afford to resolve. He also encountered evidence of earlier mining. In June 1836 a group of businessmen and gentlemen, mostly from Liverpool, but including a David Jones, presumably the one involved in 1827, took a lease. Initial success proving the lode prompted the company to obtain a search note on the adjoining Tedsmore Estate to the north. Though the lode was found at a shaft dug here, a lease was not taken up and work concentrated on the main site near Lane End. An adit was dug to drain the 1827 workings and ore was raised by a hand winch. Work continued until 1839 when the mine was sold, the new partners then falling into dispute and forfeiting the lease. A report had been made on the mine in 1837 by a Mr Henwood which was forwarded in 1840, to a London businessman, who then sold shares in a new company, the Eardiston Mine Company, raising sufficient capital to equip the mine properly and pump out water from below adit level, where the best of the ore lay. New shafts were sunk on each side of the road just south of Lane End, one in March 1841 with a three-horse whim to the east and the other to the west of the road equipped with a steam pumping engine which was in production by November. Significant amounts of ore were now being raised but not sufficient to be profitable. The ore was taken by horse and cart to the nearby Montgomery Canal at Queens Head where it was loaded onto barges and taken to Liverpool and other places for smelting. Royalty payments were late and difficulties were occurring with shareholders who did not receive information to which they were entitled on the sales of the ore. In the end the information the company refused to supply was supplied by the landowners. Despite further capital being raised by a call on the shares, the mine could not be run profitably and the company gave up the lease in September 1844. Work had ceased in the spring and the engine was dismantled and removed. A total capital of about £8,000 had been used and though much good ore had been raised it had never been sufficient - even so, it was the most profitable period in the mines history. Source The Lead, Copper & Barytes Mines of Shropshire by Michael Shaw. 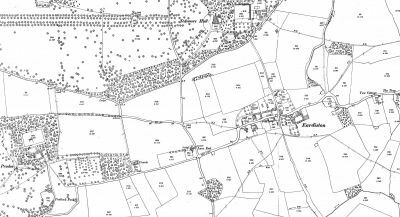 1875 map showing the Eardiston area with the Copper Mine in the plantation at the bottom of the map. 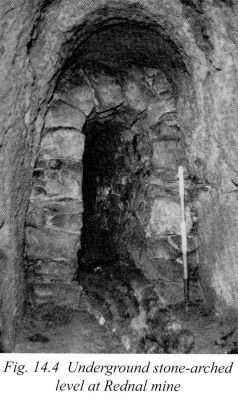 Photo of an underground stone-arched level in the Eardiston(Rednal) mine. 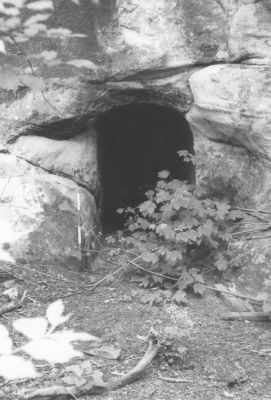 Entrance to the Eardiston mine. 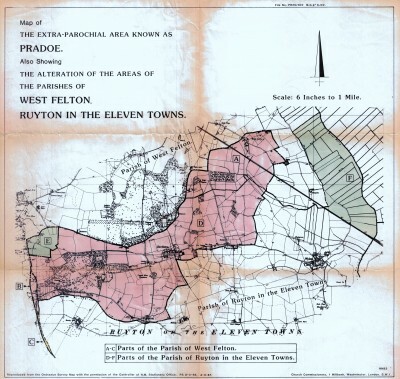 Map of West Felton and Ruyton X1 Towns parish map showing the Copper mine plantation.